"Eight Days a Week" was filmed. with the action revolving around six homes on that block. And you're probably wondering where that neighborhood is. and where Peter camped out in her front yard, in hopes of winning her love. 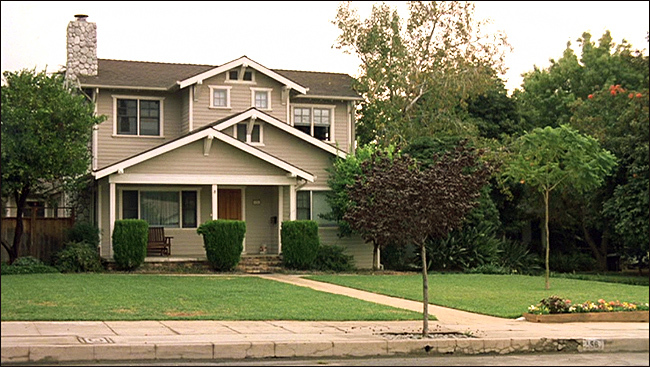 That house is located at 159 N. Primrose Avenue, in the city of Monrovia, California. Monrovia is located in northeast Los Angeles, between Glendale and Pasadena. And this block of Primrose Avenue runs north/south between Oaks Avenue and Foothill Avenue. Here is a Google StreetView of the house. As you can see, it hasn't changed much over the years. 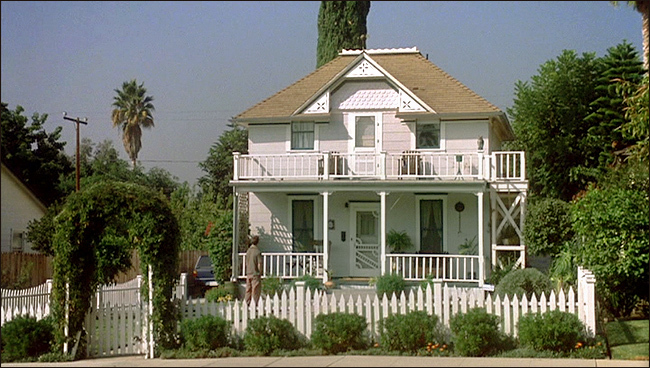 It still has the white picket fence, the unusual door, and even the flower-covered arbor. his parents and his crafty old grandfather. 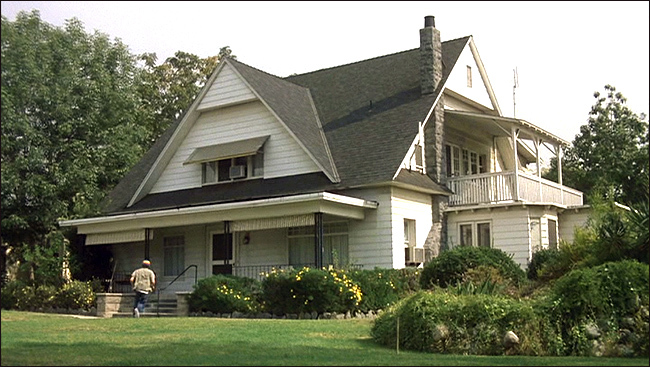 That house is located across the street from Erica's place, at 156 N. Primrose Avenue. it also hasn't changed much since 1997.
to make love to a watermelon proceeded "American Pie"'s similar routine by two years). in the movie - usually just brief shots as Matt (R.D. Robb) dashes into the two-story colonial. 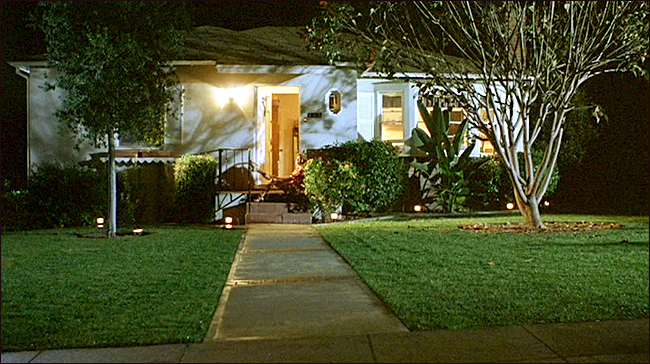 Matt's house is located two houses north of Peter's home, at 172 N. Primrose Avenue. but otherwise, it's also essentially the same as it was in the movie. his neighbors' activities. One neighbor is a man whose wife is suffering from cancer. 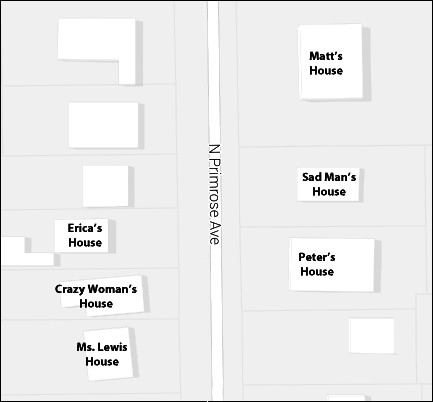 The Sad Man's house is located at 160 N. Primrose Ave, in between Peter & Matt's homes. mostly hidden behind two towering redwood trees in the front yard. 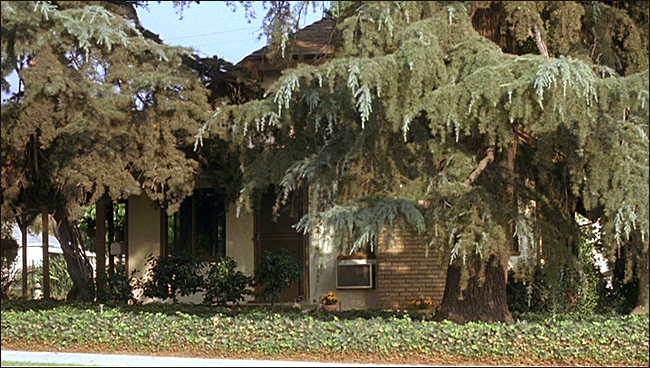 And as you can see from this Google StreetView of the house, those redwood trees are still there. Ms. Lewis is a local cougar who (unsuccessfully) puts the moves on Peter. her exercise inside to her "Buns of Steel" video. Ms. Lewis (Catherine Hicks) and the equally-horny Matt manage to hook up. Ms. Lewis's house is located at 151 N. Primrose Ave, two houses south of Erica's home. of the house, the walkway still sports those brick stripes, and the house itself hasn't changed much. It turns out that she has perfectly good explanations for her seemingly-odd behavior. the porch, as you can see in the screencap above. The photos on this page are stills from "Eight Days a Week"
(which you can buy by clicking here) and are copyright Legacy Releasing Corporation.